Eggers, Dave. The Circle : a novel. Alfred A. Knopf / McSweeney’s Books, 2013. also available in online audiobook and online e-book formats. On his list of the best business books of 2014, leadership expert/author James O’Toole names a novel as one of the best books about organizational culture for the year. The novel is The Circle by Dave Eggers, author of several best selling novels and memoirs. It is rare that a work of fiction is cited as a leading business book — with the notable exception of The Goal by the late Eliyahu Goldratt, required reading at Fuqua and many other top MBA programs. My initial reading of Eggers’ The Circle was disappointing. 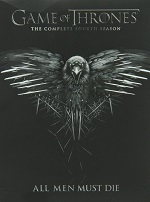 The characters were superficially drawn and did not connect to me as a reader. 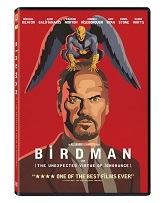 The dialog seemed stiff and some of the content was repetitive. Yet the book was a quick read for 500 pages and made thoughtful points about social media, connectedness and privacy. Two weeks later, I reviewed Invisibles by David Zweig, who describes the work culture of the people that he calls the “Invisibles” as the complete opposite of the work culture that Eggers creates in The Circle. Zweig’s Invisibles are highly skilled professionals who work anonymously, deriving meaning from the craft itself and excellence in its performance. By contrast, the characters who work in The Circle receive instant numeric feedback after each task and are driven to relentless self-promotion to improve their metrics. I went back to The Circle and my second reading gave it more stars. 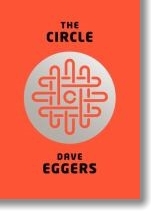 In Eggers’ novel, the Circle is the name of the company that replaces Google, Facebook, Twitter with one unified corporation that offers a single account for email, banking, social media and all other identity needs. The goal of the company is to improve the world, through utility, efficiency and transparency. The Circle pushes their employees to share their experiences through social media and in company sponsored events. Since people improve their behavior when all is visible, the Circle intensifies the habit of sharing into constant surveillance called “transparency.” Individuals are conscious of everything they do and filter everything they say. Communication sounds forced. Relationships become superficial. Life grows less spontaneous, less genuine. Perhaps Eggers’ superficial characters and unnatural dialogue were purposeful choices by an exceptional author. Or not. Either way The Circle provokes ideas about workplace culture, and about our changing attitudes around sharing and privacy. I recommend The Circle to anyone interested in the culture of organizations as well as those concerned about the changes in society arising from use of the internet. 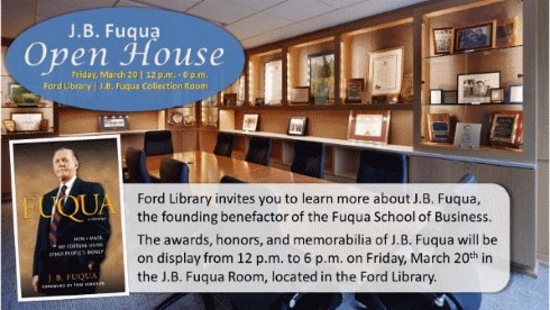 The Ford Library invites you to visit us this Friday, March 20th from 12PM to 6PM to learn more about James Brooks (J.B.) Fuqua, the founding benefactor of Duke University’s Fuqua School of Business. The awards, honors, memorabilia and an illustrated biographical slide deck of J.B. Fuqua will be on open display in Ford Library’s J.B. Fuqua Room, located at the end of the aisle of our main reading room. Please visit us to learn more about this pioneering entrepreneur, self-made man, and philanthropist. During my 33 years at Duke, I often hear faculty members say how much they love the Ford Library. They cite deep collections, seamless data, and beautiful buildings, but it is rare for anyone to acknowledge the people who make this all possible. To faculty members, the librarians who select materials in anticipation of their needs, the catalogers who make them “discoverable” online, and the IT managers who license and provide data at their fingertips, are almost invisible. Even reference librarians, once the public face of the library, are now anonymous, as research assistance takes place through email and IM. Journalist David Zweig explains why. In his book, Invisibles, Zweig shows that for professionals with key technical skills, the better they perform, the more they disappear. It is only when mistakes happen that these specialists are noticed at all. While Zweig does not analyze libraries per se, he uses many other examples of complicated work. He begins at the world’s busiest airport in Atlanta, where he interviews the man responsible for designing the cues (maps, signage, lighting, color) that direct millions of confused and disoriented passengers to their next destinations. He then moves on to the world of perfume, where a “Nose” follows a meticulous process to create new fragrances for clients. While Invisibles are found in all walks of life, many Zweig’s examples are from the arts, including architecture and music. The people that Zweig calls the “Invisibles” are happy in their anonymity. Invisibles develop an expertise within a field and find meaning in the challenges that the work presents. As masters of their craft, they enjoy taking on more responsibility and working collectively with others. Invisibles are deeply respected for their skills by co-workers but do not seek rewards or recognition from those outside their professional group. For Invisibles, excellence is its own reward. This book is recommended for all, but most especially for the Invisibles at Fuqua, as well as readers who enjoyed the best seller, Quiet by Susan Cain.